I've got Beach Boys radio on my Pandora station as I'm writing this post. It makes me happy when I'd rather be on a sunny beach, instead of dodging rain drops and staying warm in Uggs and sweaters. It's the same vein of thought for this little makeover. Most of the time our office is a nice place to be. I write my blog posts here, list items on Etsy, and Hannah enjoys movie making here; so it's not all awful gloom and doom. But there's also bill paying, and mundane stuff that happens in this room, and I'd rather have it light and sunny in here, than stuffy and formal. We started out with nothing for our home office when we moved here 5 1/2 years ago. We bought a pair of matching desks and a tower shelf from Target. Lately, the beach look was just not looking quite like what I wanted. Too dark, and not very well coordinated. So, last Fall, I started freshening up the space. 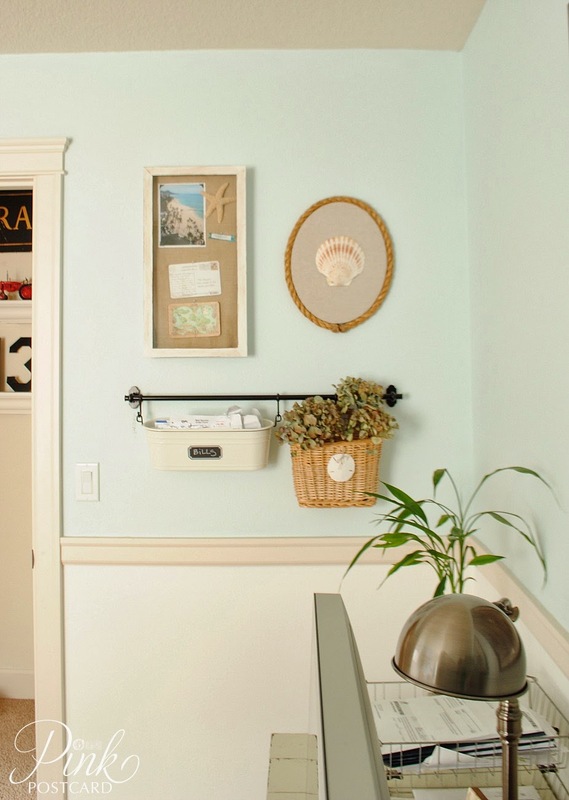 The new color is Benjamin Moore's Crystal Blue mixed in Valspar paint. It instantly lightened the room. I also painted below the chair rail- it's Decorator White. New ombre curtains in a pretty aqua color. Even though it's not obvious in the photo, I made cotton voile sheers to cover the window. Our neighbor's windows look right in here, so having a bit of privacy was necessary! We had the rope shelf to begin with, and the map wall- I just decided to cover the entire upper half in maps rather than leave any visible wall space. I picked up this garage cabinet at our local Habitat for Humanity Restore. They're actually upper cabinets. The doors were already gone, and I thought it would be cool to add some barn wood to the top, and wheels on the bottom. After living in this space for awhile, we realized we really didn't need two desks. Jon works from home at times, but he usually does it downstairs in the kitchen. 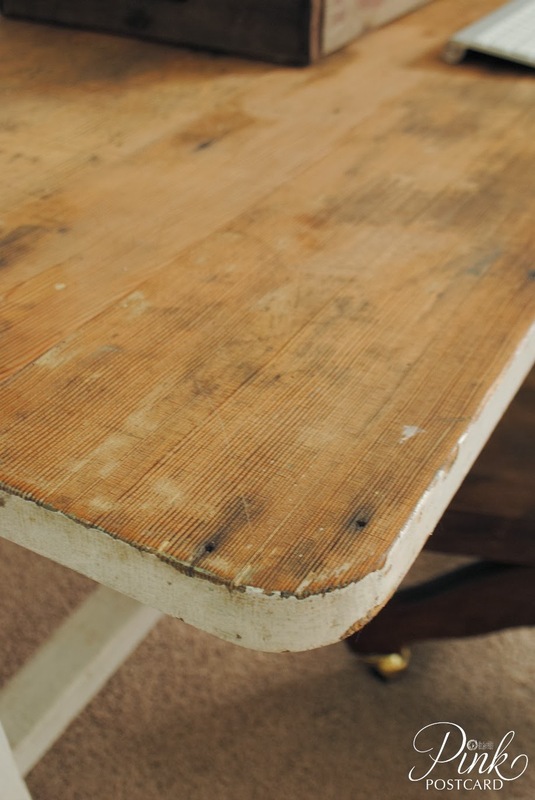 I found this awesome chippy white table a year ago. I really wanted to keep it and tried it out in our nook at first. It wasn't working, so I decided to try it up here. It fit the bill perfectly! Love the worn patina on top. I sanded it a bit, and finished it with hemp oil. I had a wicker basket that I tried for awhile as an alternate file cabinet. It ended up not functioning well for us, so I was lucky enough to find this well worn and rusty version from a vendor at Aunt Bee's House. The slatted wood top was a cool finish too. This makes me think of something that's been worn down by the salty ocean air. I also replaced the light fixture with this basket weave version from Ikea. It adds a nice retro / contemporary vibe. 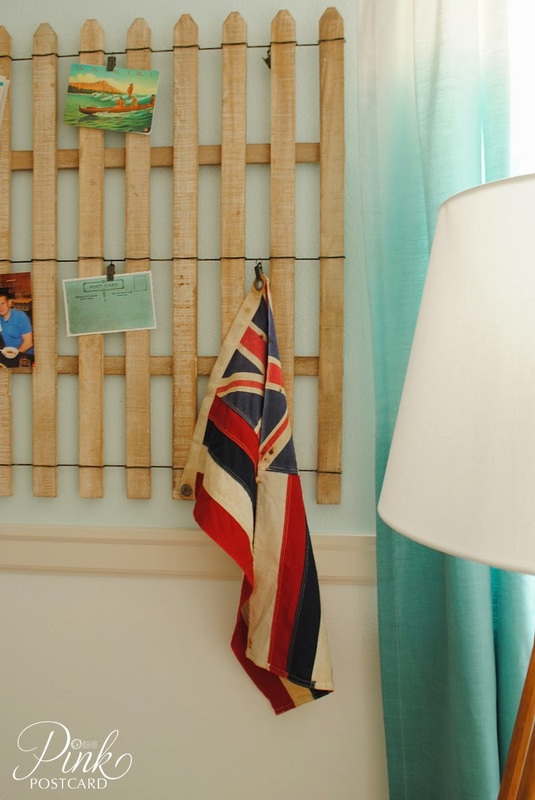 The beach picket wall hanging brings in some warmth and a worn look to the room. I spotted it in the PB Teen catalog. It wasn't even featured in the photo! It was more in the background of a bedroom shot, and I had to search the catalog to find a price. I never did, and finally looked online where it said it was on back order. It actually arrived really quick, so it must not be an item that they plan on stocking very long, considering how obscure it was!! Fun little clips to hang photos and mementos. I love that it has the look of something on a Nantucket beach! The vintage Hawaiian flag was also another find from an Aunt Bee's House vendor. We kept the tower since it works well for us still. I painted it in Miss Mustard Seed's Ironstone and gave it a good distressing with my metal scraper. 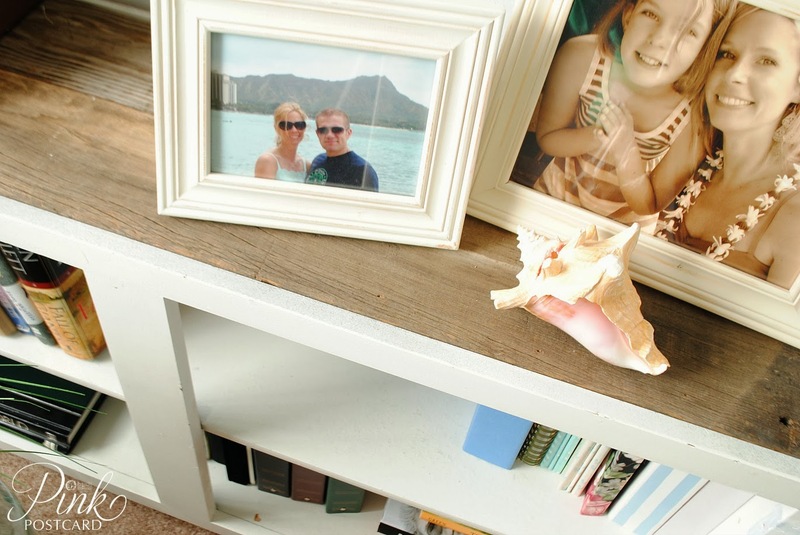 I also put all our family photos from various beach trips throughout the office. I wanted to keep the desk top fairly clutter free, so I hung an enamel pot for putting bills in. I added a little chalkboard label to the front too. It's been nice to freshen up the space, but I know we will tweak things here and there along the way. I keep trying to decide if I want an area rug in here, but I'm not usually a fan of area rugs over carpet. Adding in hardwoods isn't in the budget right now, but that would be my wish!! If you'd like to see some of the photos from our office before, you can click here, here, and here! Thanks for visiting our new lightened up space! Want to know where I got the goods? Questions about anything else? Just ask! I'll reply in the comments section in case someone else has the same thought. It looks outstanding and you know that I LOVE the beach theme. That sand fence has given me an idea (thanks). 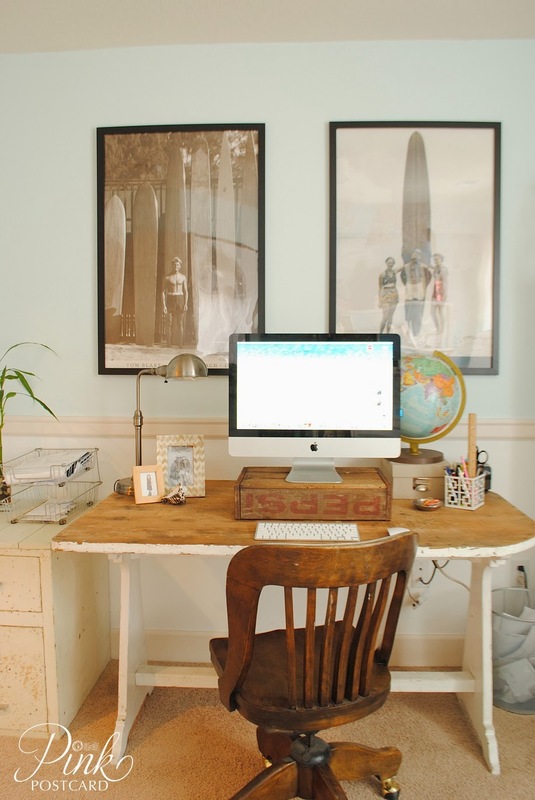 Really like the table that you are using for your desk...very charming. 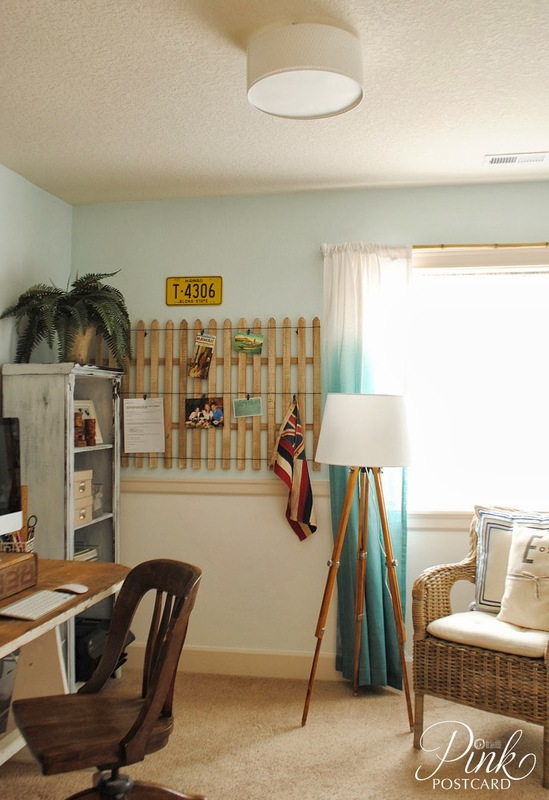 I share our home office with my hubs and he is not into me doing a re-do o=in there and I am dying to get my hands on it. looks fabulous- i love those curtains! Love the room! 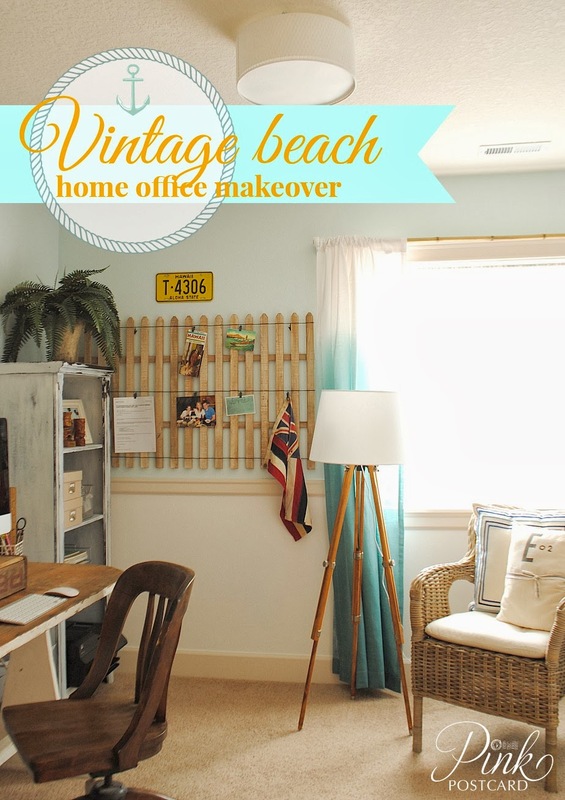 I need to revamp my craft/sewing/office this beachy style, so I don't miss the beach house in the winter! Thanks for the inspiration. What a fantastic make-over. Love everything! The room is so bright and cheery. The curtains are so fun...looks like ocean. It's gorgeous, Denise! Love the picket fence!! Very nice and love the beach picket fence. love the space. love the photos. love the color. 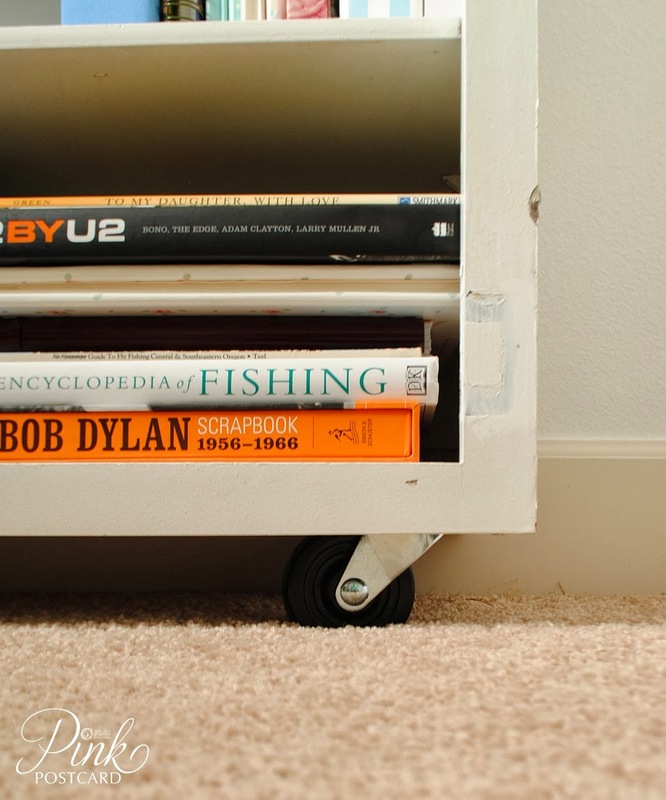 love the shelf. love the wall. love the curtains. just love,love,love! Everything is so pretty, the colors are perfect and I love that big map!!!! Looks fabulous! I am in the planning stages of making my dining room into an office that just happens to have a dining room table. 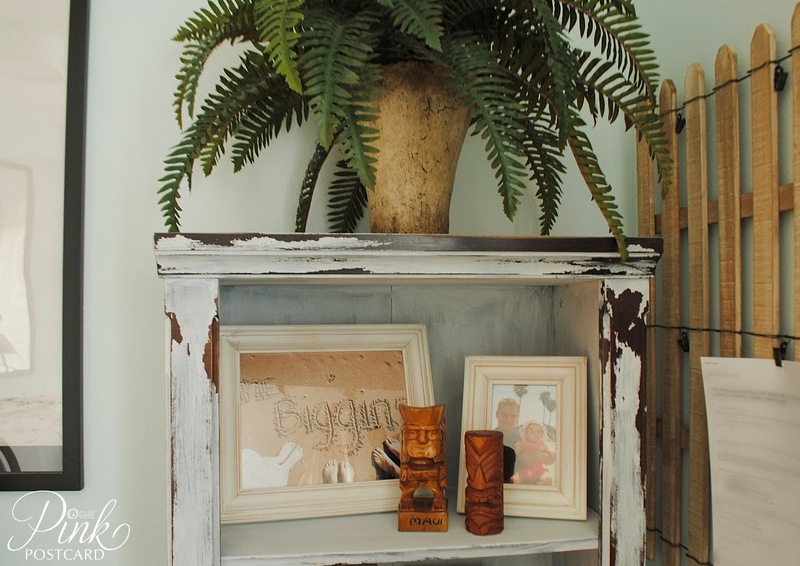 You have given me lots of ideas for storage and repurposing items. Thanks! So many fun elements in your room. I think my favorite it the rod holding the basket and the metal tin. 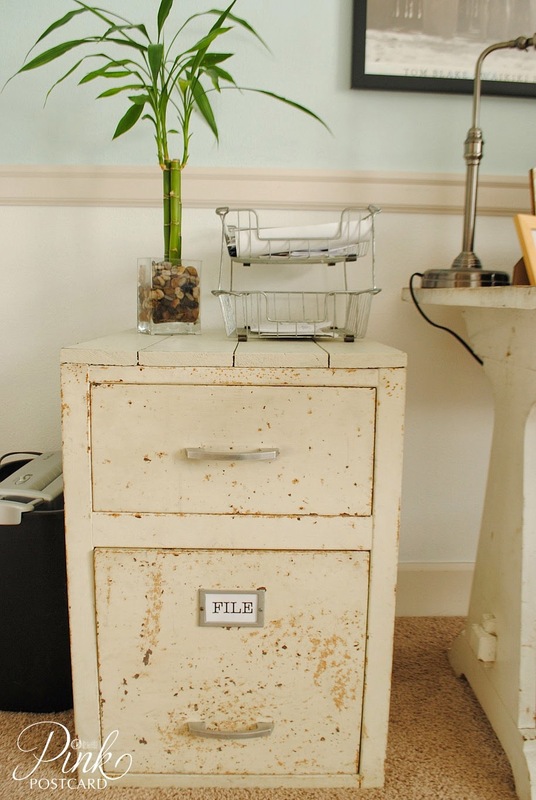 I also like the file cabinet. I like the wood on the top - makes it look less like a file cabinet. Love you room. I love the colors they are so soothing. The fence is a great idea and I have a license plate like that that I didn't know what to do with. Wow, Denise, this looks wonderful! 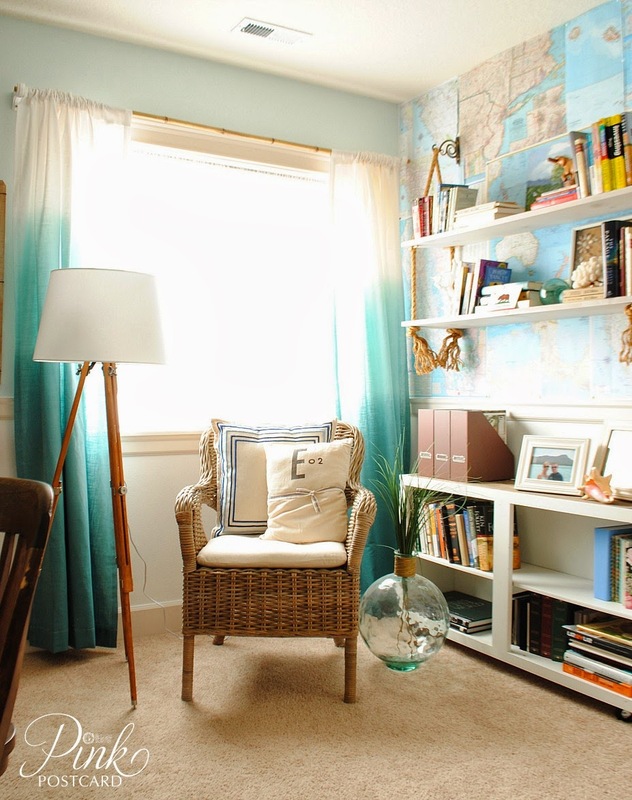 I well remember the many days of gloomy, cloudiness, so I know this bright and cheerful room is a welcoming space. Oh what a wonderful space to escape the cold and gloom of winter! 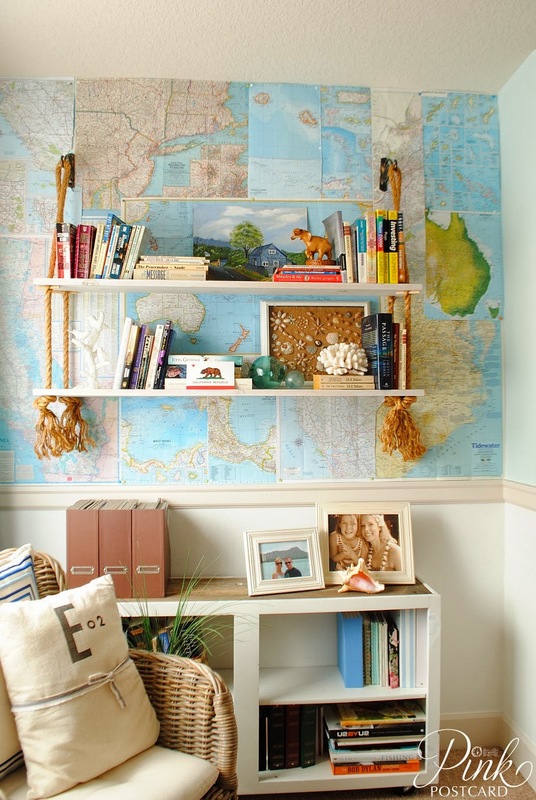 I love it all, but the map wall and shelves especially caught my eye! And the beach fence is adorable! Nicely done Denise!